Dwayne Scheuneman, Merry Lynn Morris, Frank Hull. Photo credit: Candace Kaw, USF. I am sometimes asked why I have dedicated my time and interests to disability-related issues when I am, according to visual assessment, not disabled. Of course, that assessment is already flawed given the fact that many disabilities are not visible. I always have trouble responding to this question, because in my mind the reason is clear, given that I am constantly aware how changeable and fragile life is for all of us. At some point all of us have or will experience a disabling situation or condition through illness, injury, and/or an oppressive, inflexible social, economic or political environment. Why wouldn’t I be interested and concerned with issues of disability? It is, frankly, one of the most globally and personally relevant aspects of human experience and existence. Perhaps, also, it is my life as a dancer and movement practitioner that have made me intimately aware of the tenuous and transitory nature of the body. Those who make clear distinctions between “able-bodied” and “disabled” miss the fact that at any given time individuals are only temporarily-abled by their physicality, their gender, their cultural or socio-economic status, and their environment at large. Disability fluctuates in connection with a series of factors: in particular, the relationship with one’s environment and its design. This interactive relationship between the individual and their physical and social environment was my point of entry for examining the design of wheelchairs within a dance and movement-related context. 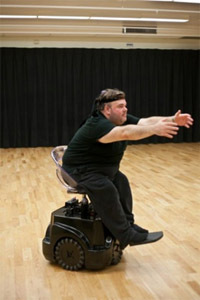 The Rolling Dance/Mobility Chair Project, a project re-formulating the design of assistive mobility devices that I began in 2005, re-imagines the possibilities of disability, dance and technology from the perspective of how people experience movement in relation to interpersonal interaction. Interdisciplinary in scope, the project has involved multiple collaborators over time, including physical therapy colleagues, engineering colleagues, Visual Realm, Inc. (CA), Vertec Inc. (FL) and Edmonston Consulting Services, LLC (FL). David Shelor and Marcie Ryan. Photo credit: Candace Kaw, USF. As expressive, therapeutic outlets, the arts have often embraced the unique conditions of diverse populations, including the elderly and those with disabilities or illness.1-5 Within the dance domain, disabled individuals have been integrated into professional dance companies, thereby distinguishing them as “mixed ability” or “integrated” companies, as well as in ballroom dance sport and in community arts centers. Over time, mixed ability dance has gained increased recognition as a viable artistic medium.6,1,2,7,8 As mixed ability choreographers and dance athletes explore new movement qualities to expand choreographic invention, the use of assistive mobility devices becomes a central focus for these athletes and choreographers and prompts new ideas for design. Foreground: Merry Lynn Morris, Dwayne Scheuneman, Background: Frank Hull, Marcie Ryan. Photo credit: Candace Kaw, USF. An unexplored area of research is the design of the assistive mobility devices used for performers with differing movement abilities to support participation in dance. Mixed-ability dance companies that employ dancers who are differently-abled often have performers in manual wheelchairs or power chairs. As these devices have been introduced in sports such as tennis, rugby, racing and basketball, technology has responded with developments targeted to meet the needs of the sport.9 Whether it be to address the desire for a tighter turning radius, faster speed, improved balance, stability or the ability to rotate more quickly, technological changes have advanced the athlete’s ability to perfect and further enjoy their sport.10 In dance it is important to find ways creatively to vary and challenge the possibilities of dynamic movement and spatial range. The conception of “motion” is not limited to the “body,” but may include equipment: aerial silks, specialized footwear or costuming, ladders, chairs, and other structural devices that serve as part of the choreographic investigation. In the case of working with individuals who use assistive devices as part of their daily movement needs, the assistive device essentially extends the body’s potential for movement and becomes a significant component to the choreography. Merry Lynn Morris, Marcie Ryan (in chair). Photo credit: Candace Kaw, USF. While I have not yet had time to create a substantive piece of choreography with the prototype chair, here is a video of the chair in action to provide a point of reference. Two key factors played a role in informing my development of the Rolling Dance Chair Project: my experience as a caregiver over a twenty-one-year period to my father, who suffered a severe brain injury in a car accident; and my experience as a dancer and as a choreographer working with dancers with and without disabilities. My father was brain-injured in a severe car accident when I was twelve years old. This event re-shaped my family structure dramatically and created a direct lived experience of the cascading effects of disability in the lives of those involved. The wheelchair—as an interface between my dad and me—was a strange obstacle of separation. It existed as a metallic, static, and industrial-looking piece of equipment preventing me from connecting with him. Prior to the accident, our relationship was full of interactive and physical play. My mom and I spent the years after the accident finding ways to re-connect with him and re-construct a life. The second motivation comes from my work as a choreographer and teacher with individuals with disabilities. In working with many individuals in wheelchairs, I began to conceive of other design ideas for the chair that might facilitate dance, promote greater, more interactive movement and thus allow more expressive possibilities. In dance, we are generally concerned with movement precision and quality/texture—the “how” of the movement, not just the movement “goal,” such as transporting a body in space from one destination to the next. Considering the wheelchair from a dance design perspective, a host of concerns other than moving from one point to another become important if we ask how we can use a chair to facilitate movement quality/texture. In particular, I noticed that the control system for most traditional chairs, hand-to-wheel propulsion or hand-to-joystick propulsion, generally restricted other options for hand/arm use in space. In the traditional chair design there were also other missing movement dynamics that I wanted to create in the chair to enable a three-dimensional experience of space. Adding height control, plus omni-directionality, and seat rotation as well as a mobile control system, create new three dimensional movement dynamics. For instance, rather than moving forward only, a dancer may move up and forward in the sagittal plane, or up and sideways in the vertical plane. I continue to look for ways to enhance the motion dynamics of the device and create intuitive, organic means of controlling it with the human body. The chair’s development, in some ways, is not unlike other types of “technological extensions” used in dance to enhance movement experience such as toe shoes, tap shoes and aerial silks. The experimentation process has consistently involved multiple perspectives. A variety of individuals with and without disabilities have tested the existing prototype chair to provide input and feedback. In both my dance work and personal life experiences, I began to notice the ways in which the wheelchair was not always conducive to human movement interaction, closeness, and the interactive dynamics of dance. Dance, of course, was not at the top of the list of priorities when the wheelchair was invented (but maybe it should have been). The original design intent was simply to address some basic functional needs of daily living: to get a person from point A to point B. My priorities were different: creatively focused, yet also relevant to important functional aspects of daily living accessibility needs. Frank Hull. Photo credit: Candace Kaw, USF. One of my other concerns in developing the device has also been a concern with the ways in which the wheelchair facilitates an individual’s long-term health. As a dance/movement practitioner with a kinesiology and movement science background, I constantly look at human movement experience with both art and science lenses. For example, working for two years at an assistive living facility, I developed movement programming for the residents. The chairs they utilized (often traditional manual chairs) did not assist in their circulation in any way by stimulating or enabling movement or supporting healthful postural positions. Instead, the individuals using these chairs were usually hunched over with their heads drooped down sagging into their chairs when I would come into the room to work with them. In developing the rolling dance/mobility chair, I have sought to embrace health concerns (posture/alignment/circulation/conditioning effects) as well as artistic ones (movement quality/dynamics, expressive relational interaction) with social and functional concerns. In sum, the omnidirectional, smartphone-controlled mobility device could be an ideal option for use in daily activity, therapy (i.e. physical rehabilitation), performance venues (i.e. social dance/theatrical dance), and/or recreation. Merry Lynn Morris, David Shelor. Photo credit: Candace Kaw, USF. With regard to social aspects of wheelchair use, consider that in many situations of caregiving, the spouse, friend, and/or caregiver stands behind the individual pushing the chair. Conversely, if a person uses a power chair, attendant controls are also at the back of the chair. This makes human communication between wheelchair user and helper virtually impossible. It also distorts the relationship between the two parties of the caregiving dyad. For instance, try talking or relating to someone who is behind you much of the time—it does not work very well. In the dance/mobility chair developed in the project, one goal was to try to facilitate human relational interactions, such as walking side by side holding hands and talking/interacting in a seamless manner. Because the mobile (smartphone) control can be worn on the body (allowing the person using the chair to keep his or her hands free) or held easily in one hand by the caregiver or individual, a more balanced relationship is restored between caregiver and wheelchair user. Another point of emphasis is the importance of height control in wheelchairs. The implementation of height control raises the disabled individual to a higher level of stature—literally. Otherwise, being in a seated position means being looked “down upon” by most standing individuals (and having elbows thrust in your face, etc.). Height change became of paramount importance in the design of this wheelchair for restoring eye contact between individuals as well as helping basic issues of reaching tasks and the like. Additionally, flexible height control for wheelchair users enables the natural greeting exchange of hugging to happen more easily. When the person is lowered in space in a seated position, hugging another person usually becomes a more awkward and less fulfilling experience for both individuals. There are many other power chairs with height control besides the one developed in the RDC project. That being said, the critical importance of a feature such as this from a psycho-social perspective has yet to be fully embraced in the assistive device industry as an absolute design necessity. In this prototype chair, an individual user has the choice of wearing the wireless control (torso, head, arm, etc.) and simply utilizing their body to propel the chair in the desired direction or holding the mobile control and tilting it in the desired direction. For instance, when the wireless (phone) control is attached to the torso, this enables an individual to multi-task with their hands while transporting from place to place. Additionally, a caregiver or another person nearby can control the device with the wireless smartphone control. This is particularly helpful in situations where a person may not be capable of operating a device very well themselves due to cognitive or other impairments. By freeing the hands for the user, the body-control option creates an ultimate freedom in multi-tasking activities and social interaction. When I began the dance/mobility chair project, my intent was literally to mobilize possibilities, both in and outside of a dance context. What the project has also revealed are the ideological structures that resist the mobilization of possibilities. In this way, the chair has served as a cultural intervention, an intervention into the status quo. In terms of what the project presents for the very notion of dancing bodies, dance training, and dance performance norms, this project represents a paradigm shift. I appreciate being in the company of a growing number of other paradigm-shifting performers, choreographers, and dance educators who are also pushing notions of disability in varying ways. Disability is an issue of global relevance, and as people live longer, it becomes even more relevant and critical to design intelligently and innovatively for people with disability.32-35 I hope that this discourse prompts further ideas for wheelchair design as an embodied, meaningful, formative element in the life of users and their friends/caregivers/partners. Perhaps the wheelchair’s form can be a morphing form rather than a stilled/static/contained form. What other possibilities could be probed? In fact, some designs, while not in vast circulation, do have embodiments which transform from seating to lying to standing apparatuses. It is up to those unique bodies who engage with and conceive of devices as dancers/performers, as caregivers, as therapists, as wheelchair users, as technologists, and as choreographers, to decode and re-code the possibilities, to invent new tactics, and to push into new places and spaces which will continue to renew and challenge our lives as embodied, interdependent, and complex human beings. It is the coalescing efforts of multiple perspectives that can more effectively enact change and together, find new possibilities and solutions for global issues of concern, such as disability. The Journal of Humanities in Rehabilitation seeks to “encourage dialogue among rehabilitation professionals, patients, families and caregivers that describe the human condition as it experiences the impact of illness or disability.” To this end, this article seeks to add to existing dialogue regarding quality of life issues for both caregivers and those with disabilities from a creative, movement-oriented perspective which critically examines the interface between human, expressive bodies and assistive devices. 1. Albright AC. Moving Across Difference. Hanover: University Press of New England; 1997. 2. Kuppers P. Disability and Contemporary Performance- Bodies on Edge. New York and London: Routledge; 2003. 3. Goodwin D, Krohn J, Kuhnle A. Beyond the wheelchair: the experience of dance. Adapted Phys Activity Q. 2004;21:229-247. 4. Warren B, ed. Using the Creative Arts in Therapy and Healthcare: A Practical Introduction. 3rd ed. New York, NY: Routledge; 2008. 5. Serlin I, ed. The arts therapies: whole person integrative approaches to healthcare. In: Whole Person Healthcare. Westport, CT: Praeger Publishers; 2007:107-121. 6. Kuppers P. Accessible education: aesthetics, bodies, and disability. Res Dance Educ. 2000;1(2):119-131. 7. Albright AC. Strategic abilities: negotiating the disabled body in dance. Michigan Quarterly Review.1998;37:475-501. 8. Whatley S. Dance and disability: the dancer, the viewer and the presumption of difference. Res Dance Educ. 2007;8(1):5-25. 9. Van der Woude L, De Groot S, Janssen T. Manual wheelchairs: research and innovation in rehabilitation, sports, daily life and health. Med Eng Phys. 2006;28: 905-915. 10. Cooper RA. High-tech wheelchairs gain the competitive edge. IEEE Eng Med Biol Magazine: Q magazine Eng Med Biol Soc.1990; 10(4):49-55. 11. Arshak K, Buckley D, Kaneswaran K. Review of assistive devices for electric powered wheelchairs navigation. ITB Journal. 2006;13: 13-23. 12. Fehr L, Langbein WE, Skaar SB. Adequacy of power wheelchair control interfaces for persons with severe disabilities: a clinical survey. Development. 2000; 37(3): 353-360. 13. Han J, Bien Z, Kim D, Lee H, Kim J. Human-machine interface for wheelchair control with EMG and its evaluation. Proceedings of the 25th Annual International Conference of the IEEE. 2003;2:1602-1605. 14. Huo, X, Ghovanloo M. Evaluation of a wireless wearable tongue–computer interface by individuals with high-level spinal cord injuries [published online ahead of print March 23, 2010]. J Neural Eng. 2010; 7(2):026008. doi:10.1088/1741-2560/7/2/026008. 15. Simpson R, Levine S. Voice control of a powered wheelchair. IEEE Trans Neural Syst Rehabil Eng. 2002;10(2):122-125. 16. Barea R, Boquete L, Mazo M, López E. System for assisted mobility using eye movements based on electrooculography. IEEE Trans Neural Syst Rehabil Eng. 2002;10(4): 209-218. 17. Kannan R, Megalingam A, Thulasi AR, et al. Thought controlled wheelchair using EEG acquisition device. Presented at: 3rd International Conference on Advancements in Electronics and Power Engineering; January 2013; Kuala Lumpur, Malaysia. 18. Kim J, Park H, Bruce J, et al. The tongue enables computer and wheelchair control for people with spinal cord injury. Sci Transl Med. 2013;5(213): 213ra166. 19. Simpson R. Smart wheelchairs: a literature review. J Rehabil Res Dev. 2004;4(4):423-436. 20. Simpson RC, LoPresti EF, Cooper RA. How many people would benefit from a smart wheelchair? J Rehabil Res Dev. 2008;45(1):53-71. 21. Kim J, Huo X, Minocha J, Holbrook J, Laumann A, Ghovanloo M. Evaluation of a smartphone platform as a wireless interface between tongue drive system and electric-powered wheelchairs. IEEE Trans Biomed Eng.2012;59(6): 1787-1796. 23. Milenkovic A, Milosevic M, Jovanov E. Smartphones for smart wheelchairs. Presented at: IEEE International Conference on Body Sensor Networks; May, 2013; Cambridge, Massachusetts, USA. 24. Santhanam V, Viswanathan V. Smartphone accelerometer controlled automated wheelchair. Presented at: Proceedings of the 3rd International Conference on Electronics, Biomedical Engineering and its Applications; January 2013; Hong Kong, China. 25. Morris M, Rumsey M, inventors; Omnidirectional mobility device. US patent D719, 071S. December 9, 2014. 26. Morris M, De Laurentis K, Highsmith M, Carey S, Mengelkoch L. Evaluation of an assistive mobility device for dance training and performance. Presented at: Proceedings of the 2010 International Association of Dance Medicine and Science Conference; October, 2010; Birmingham, UK. 27. Morris M, De Laurentis K, Carey S, et al. 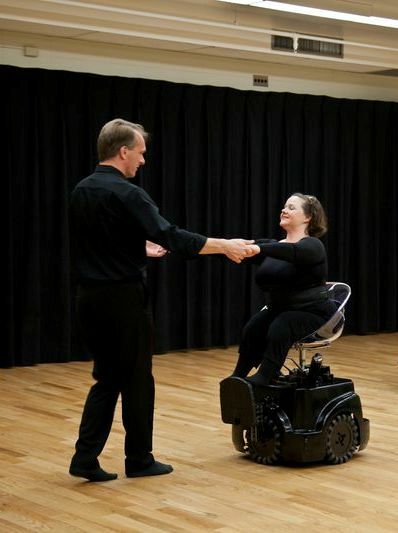 Dance and engineering link to produce a novel mobility device. J Innovation Technol. 2011;13:213-224. 28. Schrock P, McQueen M, De Laurentis K, Morris M. Wheelchair modification for hands-free motion for dancers with disabilities. Presented at: Proceedings of the 2008 ASME Summer Bioengineering Conference;June, 2008; Marco Island, Florida, USA. 29. Samuelsson KAM. Shoulder pain and its consequences in paraplegic spinal cord- injured wheelchair users. Spinal Cord. 2004;42(1):41. 30. Veeger HEJ, Rozendaal LA, Van Der Helm FCT. Load on the shoulder in low intensity wheelchair propulsion. Clin Biomech. 2002;17(3):211-218. 31. Mengelkoch L, Highsmith MJ, Morris ML. Comparison of the metabolic demands of dance performance using three mobility devices for a dancer with spinal cord injury and an able-bodied dancer. Med Probl Perform Art. 2014;29(3):161–165. 32. Crews DE, Zavotka S. Aging, disability, and frailty: implications for universal design. J Physiol Anthropol.2006; 25(1):113-118. 33. Pullin G. Design Meets Disability. Cambridge, Mass: MIT Press; 2009. http://site.ebrary.com/id/10281463. Accessed January 15, 2014. 34. Monaghan P. Design for disability will become the norm. Chronicle of Higher Education Web site. http://chronicle.com/article/Design-for-Disability-Will/63868/. Accessed February 10, 2010. 35. Goldsmith S. Designing for the Disabled: The New Paradigm. New York: Routledge; 2012. Dr. Morris reports financial support from the Thatcher Hoffman Smith Prize. In addition, Dr. Morris has patent D719, 071S, patent D642,962S, patent 7,748,490 with no royalties paid, and an additional patent pending. Merry Lynn Morris holds a Masters of Fine Arts degree in dance performance and choreography from Florida State University. She has been an instructor in the dance program since 1998 at the University of South Florida, in Tampa, FL. Ms. Morris seeks out interdisciplinary opportunities in which her movement background and expertise can be utilized and expanded. She began exploring the venue of mixed ability dance in 2002, and as caregiver to a disabled father over a 21 year period, her interest and awareness in disability needs has been ever-present. Her dance/mobility chair project involves approaching wheelchair design from a dance performance perspective to increase options for differently-abled individuals and expand perceptions regarding human mobility. 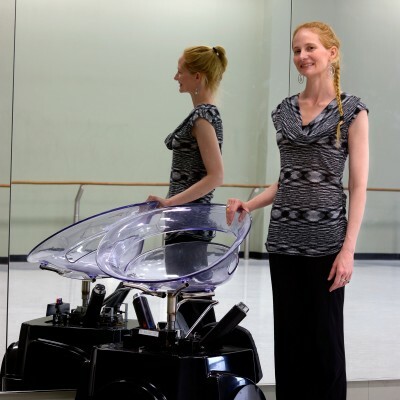 The project has received national and international recognition and Ms. Morris is the recipient of three patents for her work on the rolling dance chair. Ms. Morris is dedicated and invested in contributing to the full scope of dance practice, including dance pedagogy, movement expression/choreography, and the health and wellness of dancers. Her work is unique in simultaneously responding to significant issues both in and outside of the dance field and in bridging gaps and broadening the discourse between dance/arts and other fields. Ms. Morris is a member of the National Academy of Inventors (NAI), the National Dance Education Organization (NDEO), and the Florida Dance Education Organization (FDEO). Ms. Morris continues to pursue research and study in the area of dance medicine/kinesiology and she is also a member and regular presenter at the International Association of Dance Medicine and Science (IADMS). Ms. Morris is currently working on a doctoral degree in Dance at Texas Woman’s University.